Leading up to your procedure, do not start taking any new medicines without consulting your doctor. You may be given pre-procedure medicines for certain conditions (eg, to suppress a cough). A small cut will be made in your skin. Then, while you hold your breath, the biopsy needle will be inserted through the cut. 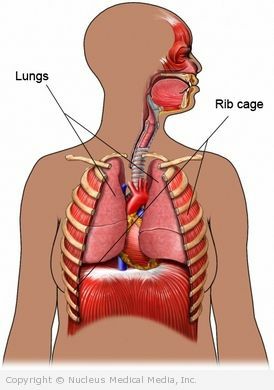 The needle will be passed between your ribs until it reaches the lung or pleura. Your doctor then withdraws some cells through the biopsy needle. The needle will be withdrawn. Pressure will be put on the site of the incision. When the bleeding stops, a bandage will be applied. Needle biopsy of the lung and pleura – How Long Will It Take? Needle biopsy of the lung and pleura – How Much Will It Hurt? You may rest for several hours after the procedure. A nurse will check on you and monitor your recovery. If there are no complications after four hours, you may go home. Rest at home for a day or two. Avoid strenuous activities for one week. You may remove the bandage after a day or two. Ask your doctor when to expect the results of the biopsy.